Our 2011 Road Trip #28: Last Call for Roadside Attractions « Midlife Crisis Crossover! They did it! Congratulations! World’s greatest 9/11 marker! Great job, everybody! 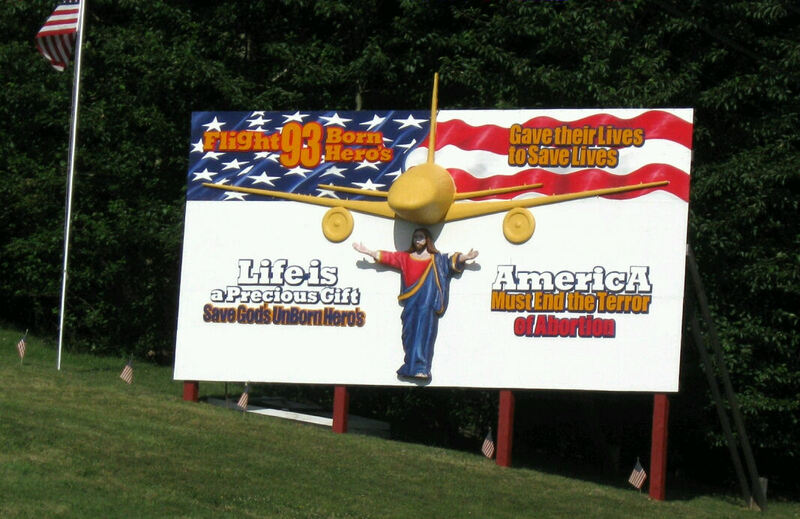 The highway and back roads leading to and from the Flight 93 National Memorial included a few token expressions of belief. This was the most eye-catching. As a Christian, I wanted to cry. And to drive over it. 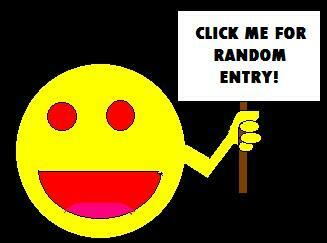 Several times. Setting aside questions of topical relevance and basic composition (is Jesus trying to catch the plane? or is the plane buzzing disrespectfully by his scalp like Maverick in Top Gun? )…out of all the townspeople it took to assemble and erect this heartfelt expression of free speech, not one of them volunteered to proofread. Or do focus-group duty. The rest of our drive back to our Somerset hotel was comparatively benign, aesthetically speaking. The Jenny Globe appears to advertise a local dry-cleaning concern. Or maybe this was built by that one guy who’s tired of getting a busy signal every time he dials 867-5309. 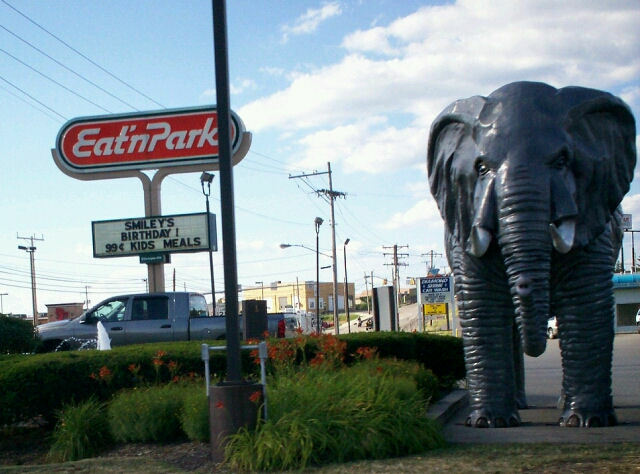 By this time in our trip no one was in the mood to stop for elephant burgers. We had dinner at a modest sit-down called the Pine Grill. It’s the only joint I’ve ever seen selling Buffalo fries, and the only place we’ve caught selling pierogi. It was just different enough to rate a mention. DAY NINE — Sunday, July 17, 2011. Our seventh wedding anniversary. We slept in on Sunday, and consequently spent our morning competing for breakfast buffet scraps with all the other hotel guests. The staff failed at keeping up with demand. The crowd stopped just a few decibels short of a feeding frenzy. What remained of Pennsylvania was a blur of lush greenery, broken up by the ten minutes that I-70 takes to cut through the narrow upper point of West Virginia. 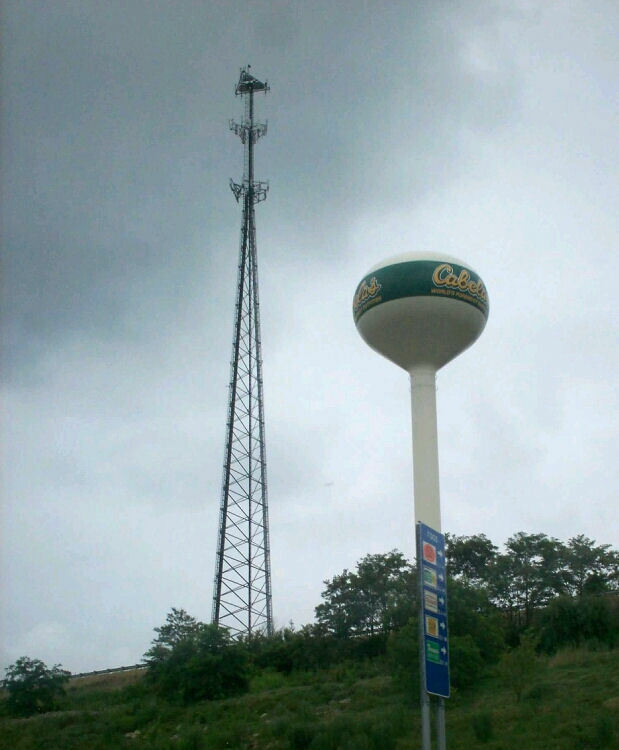 The Cabela’s in Wheeling sets out bait for road-trip mavens who brake for painted water towers. 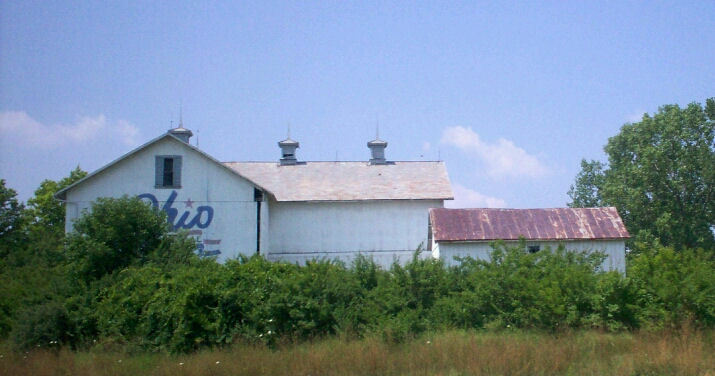 Next came Ohio, which tried in vain to disguise itself. WE SEE YOU THERE, OHIO. What? No, we’re the new state of Chico! Ohio is some other guys and totally not us. That four- or five-hour stretch of Ohio was soooooooo boring and deadening, not even CDs and occasional conversation could save us. 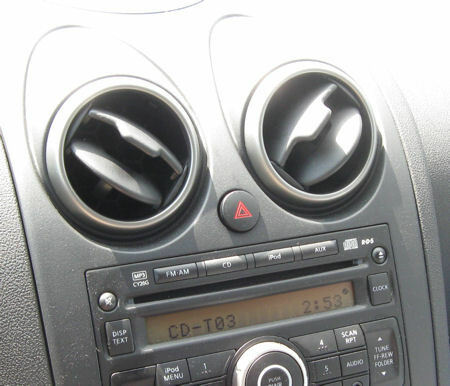 We began to imagine our dashboard was making faces at us. We named it Nissankitty. Nissankitty was our constant companion through times of boredom and strife, by which I mean more boredom. Nissankitty felt our pain and would probably have helped us if only he could, except he was also trapped in big long boring Ohio with us and was therefore just as helpless as we were. Nissankitty was supposed to save us, but let us down. CURSE YOU, NISSANKITTY. At some indeterminate point in the midst of the Ohio monotony, we stopped for lunch at the first place I ran across when I randomly determined it was time for lunch: an everyday Wendy’s in a town with an unfortunate name. That stop: Newark, Ohio. My son was zoned out in the back seat, his usual pose for these drives. I shouted back to him, “Okay, we’re stopping for lunch in Newark!” The look on his face was priceless. Newark, OH, was the exact opposite of its New Jersey mean-sister city in every way imaginable: safe, bland, mostly white, fairly clean, and not likely to be used as a stand-in for Crime Alley in a Batman film. The street-tough facades that we had honed so sharply in the ‘hoods of Manhattan, and while driving with our heads down through the scary stabby part of the Garden State, wouldn’t be needed here. After lunch, Ohio threw one last challenge at us in the form of a complete traffic jam outside Dayton. Far as I can recall, I think we slept our way through it. Other than gas, we didn’t stop again till we were back in home territory, past the border of decidedly non-Ohio Indiana. 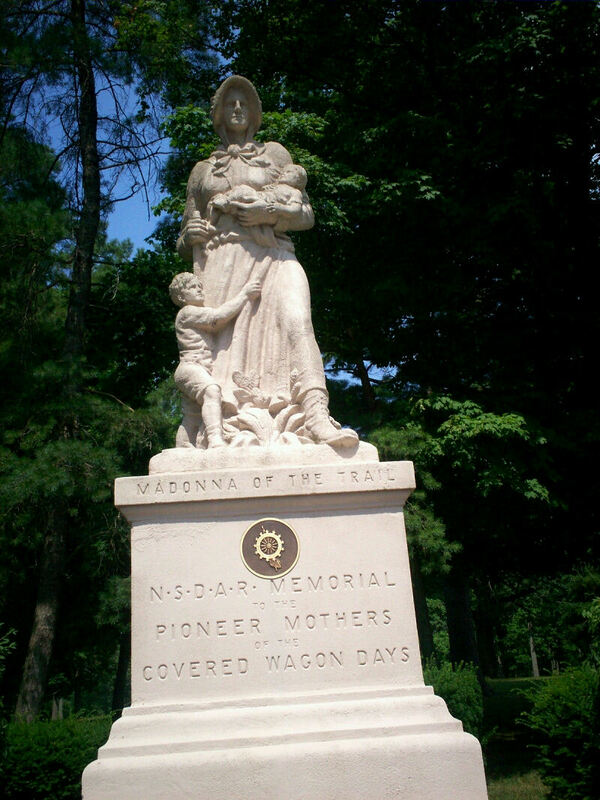 At Anne’s request we detoured in Richmond, IN, to snap a pic of a Madonna of the Trail in a public park. 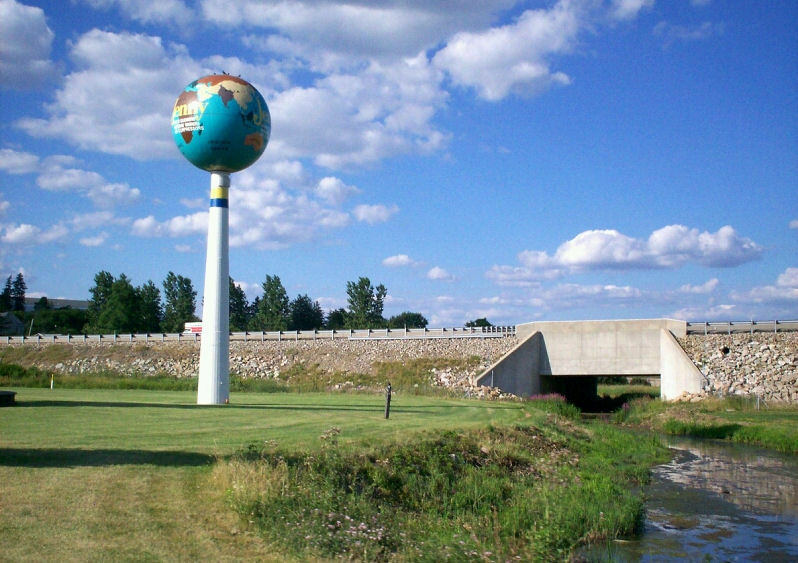 Several of these stand at various points along famous U.S. Highway 40. She can tell their story better than I can. They’ve been out of our way on several past vacations, but we wanted to photograph something meaningful on our last day. If nothing else, she was a pleasant one-woman welcome wagon ushering us back into our home state. Eventually we arrived home, worn down but intact, and with a fresh set of memories and lessons to carry forward with us. My son remains inspired by this trip to spend his adulthood escaping from Indianapolis to a giant-sized city. He would prefer Tokyo, but if air travel is still an impossibility, he’s now decided he could settle for New York. Regardless of whether or not everything falls apart, many of the one or two dozen sights that we failed to see from my short-list are great reasons for us to return someday. I took away a whole new appreciation for the scores of movies, TV shows, and books set in New York, whether it’s noticing all the location name-checking in old issues of Amazing Spider-Man, recognizing intersections in the security-cam montages on Person of Interest, or spotting specific Times Square fixtures in the final scene of Captain America: the First Avenger. I also decided I want a subway station that connects Manhattan to our backyard. If it means losing the retention pond, so be it. It’s not like New York would notice all that extra construction. And I like to think my wife has a little better understanding of that moment in 2010 when my son and I kept staring across the river at the City That Never Sleeps, ignoring the Statue That Never Sits, and looking forward to a vacation we never forget. But all things considered, it was nice to return to the safety and coziness of Indiana’s arms once more. 1. 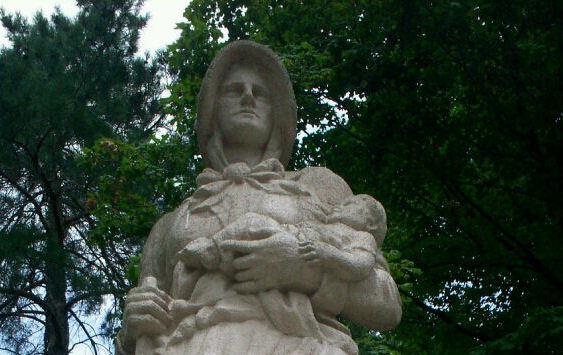 To learn more about the Madonna of the Trail in other states, be sure to check out previous MCC visits to Vandalia, IL; Lamar, CO; and Springfield, OH! That’s four down, eight to go. Glad you made it home safely. 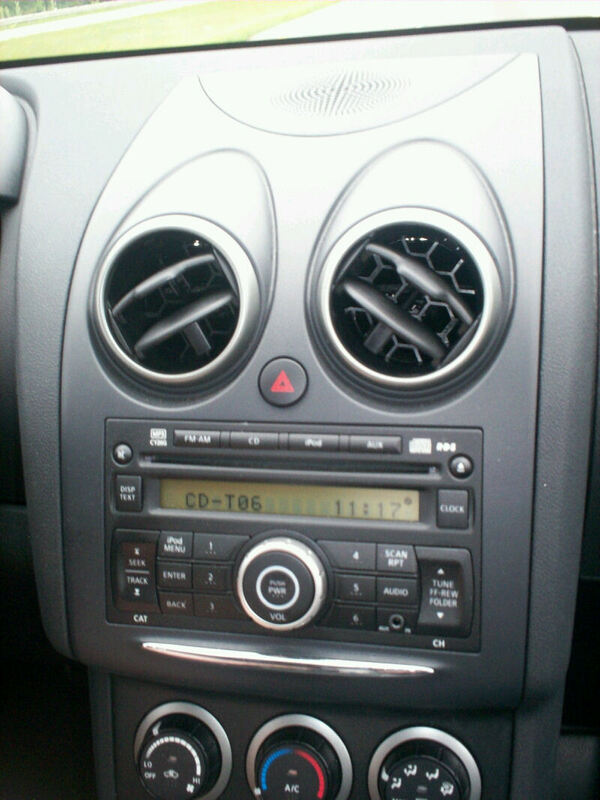 Nissankitty, too funny. And the other thing, Just no…no is sufficient. I have a photo somewhere, from back in the days when there where actual printed photos, of the world’s largest ketchup bottle. I think that landmark is near Paducah or Mascoutah or Cahokia. It was a long time ago. Those giant objects are always fun. After so many road trips my son lost interest and stopped getting out of the car for them, but my wife and I still brake for ’em. Kids these days just don’t appreciate the value of colossal-kitsch, I guess.